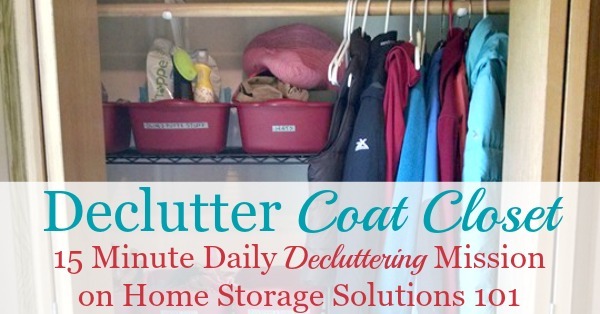 Today's mission is to declutter your coat closet, or entry closet, so that it can perform its intended function of holding coats and other items for family members and guests. This mission is designed to be done while we work through the Mudroom & Entryway Organization Challenge here on the site, which is one of the 52 Week Organized Home Challenges. 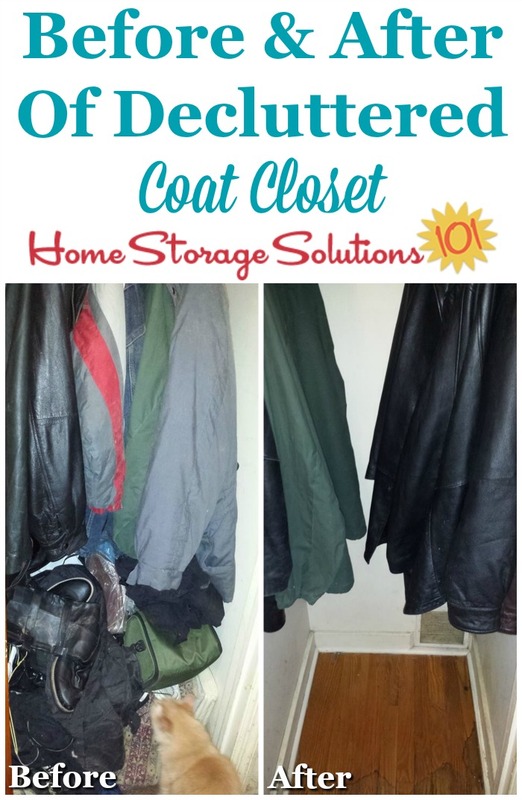 The reason is that often the coat closet, or other closet located by your home's entry, is there for the purpose of holding your household's coats, as well as guests' coats, as they come in the door. This means that today's mission is also a follow up to yesterday's Declutter 365 mission to declutter your entryway. You can do this mission whenever you feel you need to in your home though, because it seems coat closets are a prime spot to accumulate clutter in your home, because of their close proximity to the door, and because you can shut the door of the closet and kind of forget what's in there. Today's the day you're going to remember what you've got in that closet, and make sure it is only stuff you want to keep there, and in your home in general. To help you declutter and organize this space it's helpful to first decide, for yourself, what the functions of your coat or entry closet are, in your home. There's no right or wrong answer, but some common purposes (and often what the closet is designed to do) is to hold coats and jackets. Duh. That's why it's called a "coat closet." Of course, we often use this space for other purposes as well, including holding shoes that people take off at the door, and then want to put back on before they leave again, as well as also storing other weather clothing gear, such gloves, scarves and winter hats. In addition, even more stuff is often found in this type of closet, such as large cleaning equipment like the vacuum cleaner. It can also be used for general storage, or as a catch all for junk. I suggest you only add some of this additional stuff into the space if other things, like coats and jackets, and then shoes and winter clothing gear, all fit into the space first, without becoming too jam packed in there. The reason is that you can always (especially as you continue to declutter your house) find another place for the vacuum, or for general storage, but it's harder to find a more convenient spot for coats than in the coat closet itself. 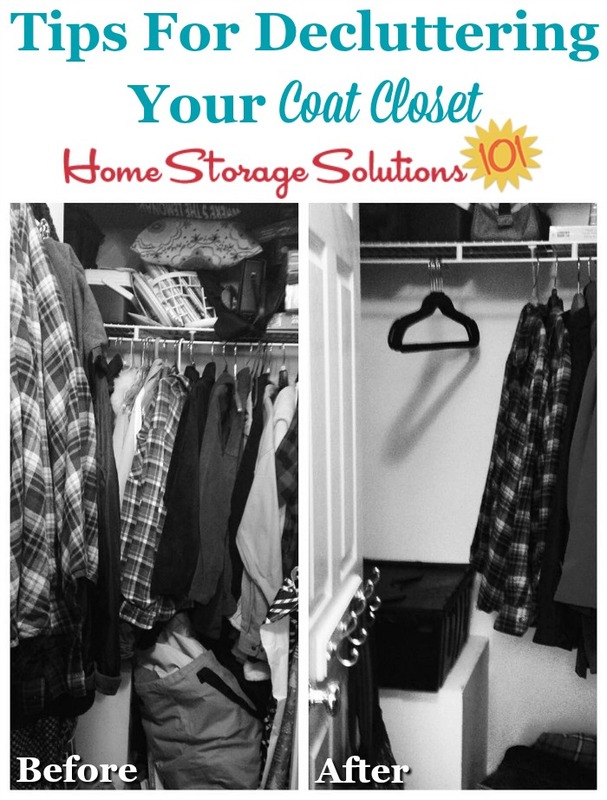 Typically, a coat closet is relatively small, so we often think we can just pull everything out and tackle the whole thing at once. And if your coat closet isn't stuffed to the gills you might just be able to. However, if you've only got a limited amount of time to declutter at once, you get tired easily, and/or you're afraid when you open your closet up an avalanche of stuff might fall onto you, it's better to work on the closet in smaller sections, instead of trying to deal with everything in there all at once. Also, make sure to check out this article about decluttering shoes by your entryway that we worked on previously, during the Shoe Organization Challenge, to understand why keeping a limited number of shoes close to the front door, perhaps inside your coat closet, is perfectly fine, but how to make sure the total number of shoes in this space does not keep multiplying out of control. Since there are a couple of missions that can help you deal with many of the most common items in your coat closet, go ahead today and tackle whatever section or type of item in the closet needs it most, such as the floor, a shelf, the shoe rack you've got in there, boxes, large cleaning equipment, or whatever else. Make sure to finish dealing with all of one section, or one type of item, before moving on to the next. This allows you to keep from making a huge mess that you don't have time to clean up, if you've got to stop and do something else before you've dealt with everything in your closet. While sorting and decluttering you'll most likely come across items that should stay in your home, but don't belong in your coat closet. 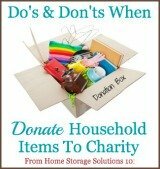 Make sure to take them to wherever in your house these items go and put them away. In addition, you'll most likely find some items that have been outgrown, not used in quite a while, or otherwise you don't want or need, so make sure those things get out of your house, either into the trash, donated, or ready to be sold. Keep decluttering, section by section, until you feel like you've got more than enough space in your closet for the items you'll continue to store in there, and also a bit more room to store items for guests, such as their coat or shoes, when they stop by. Below I've got quite a few photos from other Declutter 365 participants who've already done this mission, so you can see what they did, cheer them on for their accomplishments, and also get yourself motivated to tackle this task in your own home. First, here's a photo from a reader, Beth, who shared a photo of her closet after she'd decluttered it. She said, "Our coat closet: got rid of any shoes that do not fit any longer, as well as random stuff that was in there." Next, here are before and after photos from a reader, Patsy, below. There's a lot less stuff in that after photo, isn't there? 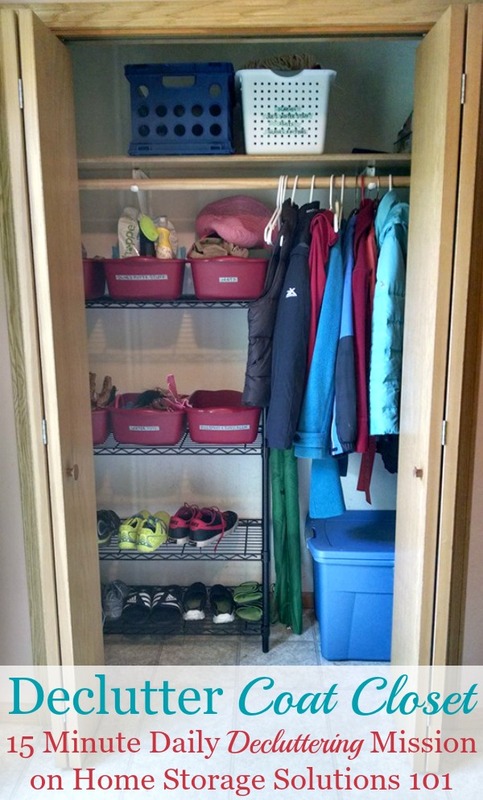 Sherry, another Declutter 365 participant, sent in these before and after photos of her closet. She cleared out all the stuff that was on the floor of this space, and then explained of the after photo, "There will be a couple more coats added, but they have to visit the dry cleaners first." 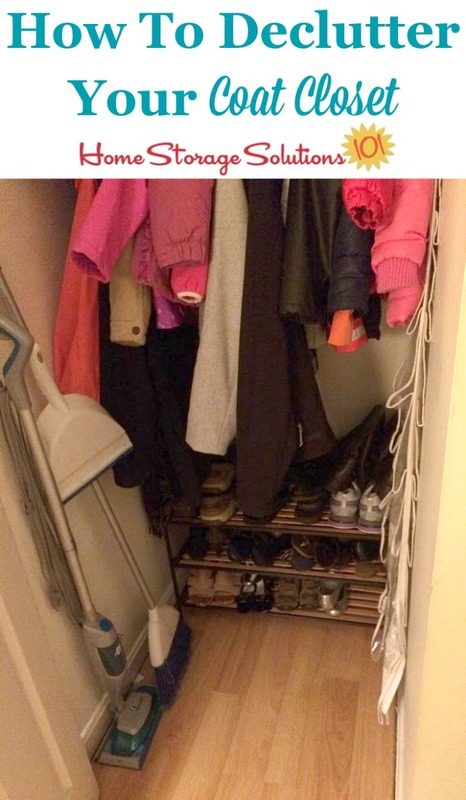 Finally, here are a couple of photos from Valerie, who showed us what her closet looked like during the decluttering process, and after she'd put everything back away at the end. Valerie explained, "One good thing about losing your passport??? You're forced to rip everything apart- then you can declutter as you clean up the mess!" She explained of the after photo, "The tidy closet after the passport fiasco." 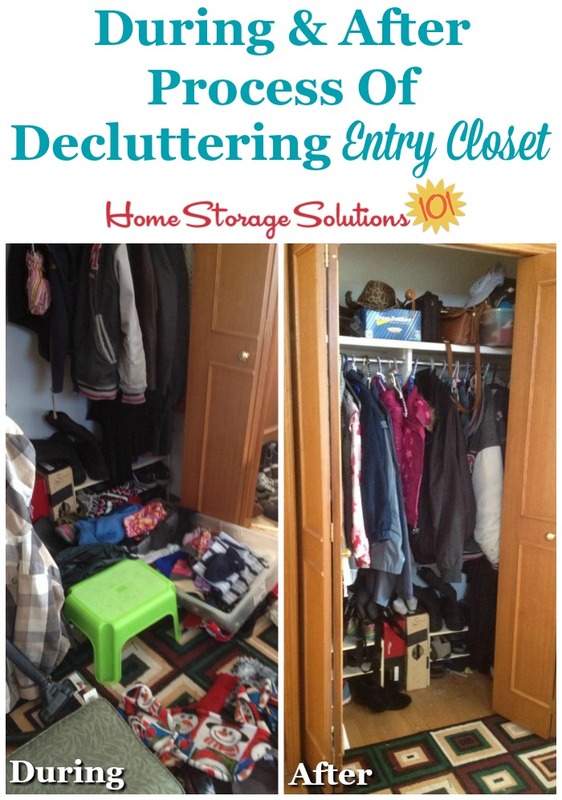 I hope seeing these pictures and instructions have inspired you to declutter your coat closet in your home.